Should I have my dog on tick protection all year ’round? 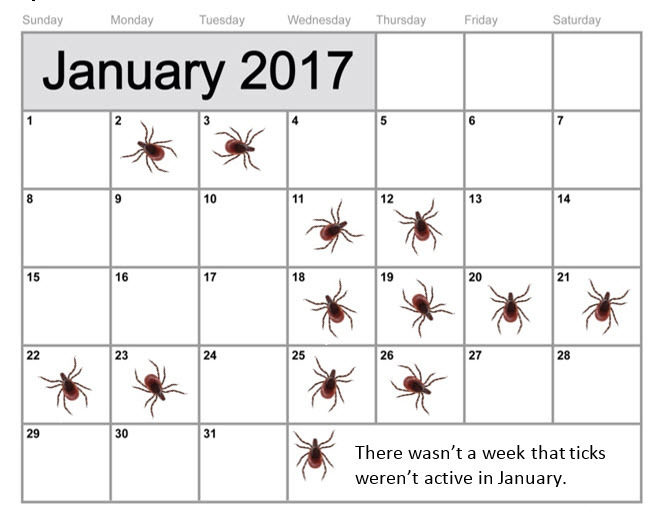 There’s no such thing as a specific “season” for ticks. The reality is that they’re active any time the temperature is 4 C or higher. And that could be any time of the year. Take last winter for example – December 2016, January and February 2017. 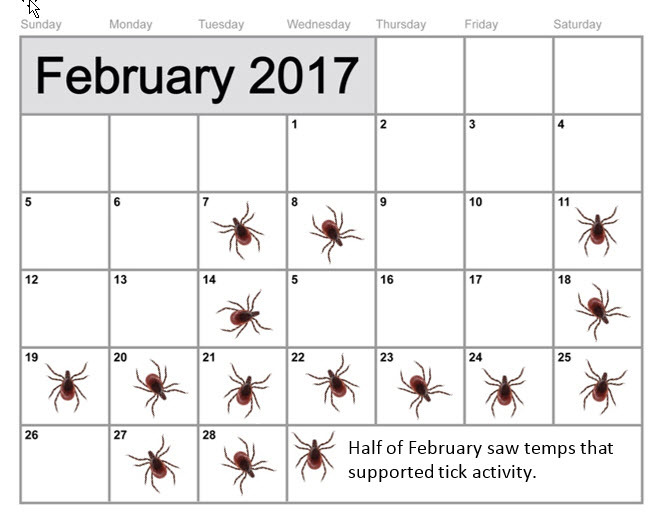 Each day in Etobicoke that fit that bill is shown here with a tick – 36 days in all, with temperatures rising as high as 19.1 C (in February no less!). 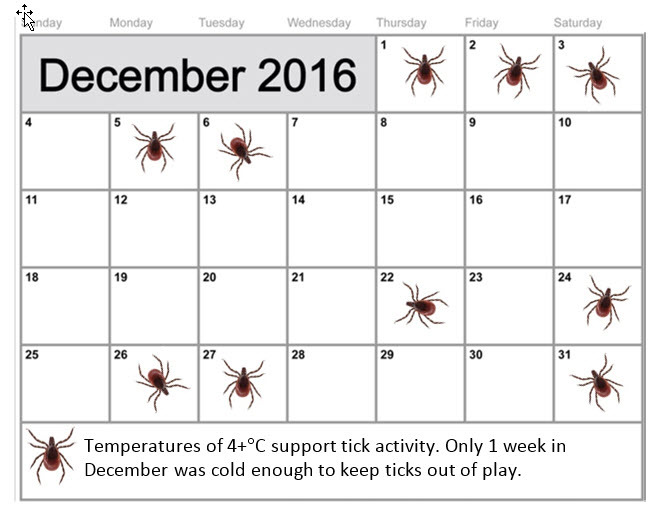 Even in January, the “dead of winter” that gives us the coldest days of the year, it wasn’t cold enough for ticks to play dead. What will the winter of 2018 hold? The only predictable thing about the weather is that it’s unpredictable. So it comes down to your tolerance for risk. 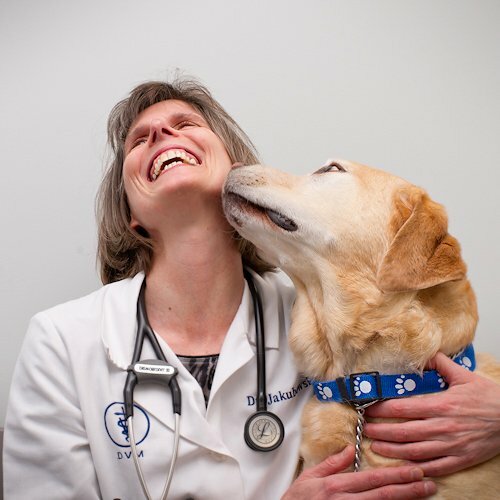 If you have little or no tolerance for it and want to be able to take your dog for a walk wherever and whenever you like without worrying about ticks and the diseases they transmit, then year-round protection is for you. The nice thing about Bravecto, our ‘go to’ for tick protection, is that a single chewable tablet treats your dog fo r 3 months. You’ve got the winter covered right there.